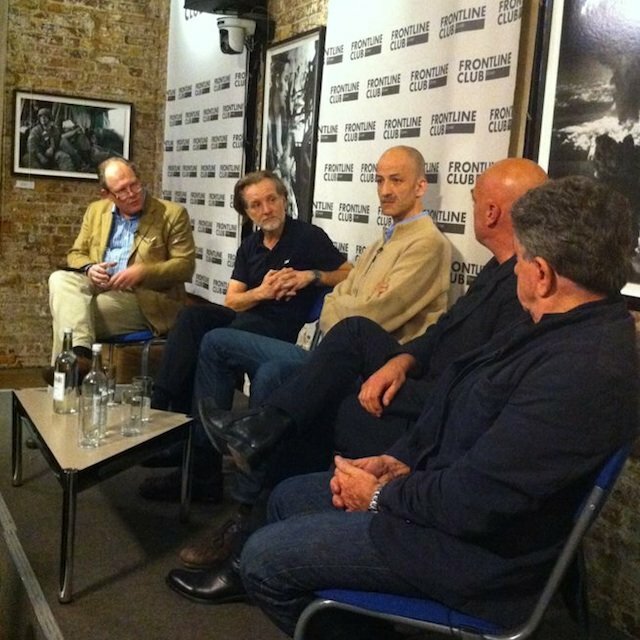 From left: Vaughan Smith, Paul Lowe, Charif Kiwan, Remy Ourdan and Patrick Chauvel at the Frontline Club. At the screening of Syria – Snapshots of History in the Making on Thursday 29 May at the Frontline Club, host Vaughan Smith was joined by Abounaddara Films producer Charif Kiwan, former Le Monde editor and founder of the WARM Foundation Remy Ourdan, and photographers Patrick Chauvel and Paul Lowe, for a pre-screening discussion as well as a Q&A after the film. The journalists, all members of the WARM foundation dedicated to war reporting and war art, discussed the impact and importance of reporting from conflict zones leading up to the documentary.